Wasabi Japense Restaurant in Breckenridge, Colorado, offers delicious Japanese cuisine and sushi, a relaxed atmosphere, and friendly service. We import the freshest fish from Japan (and all over the world), which allows us to offer a wonderful, large selection of sushi and sashimi, rolls, traditional Japanese cuisine, our famous chef's creations, daily specials, and a wide variety of vintage Sake imported directly from Japan. Wanting to dine with us but your friends don’t like sushi? No problem! 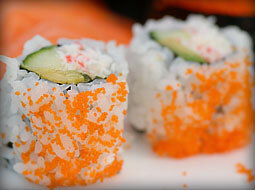 We serve plenty of dishes that have nothing to do with raw fish. Taste our Japanese Fried Chicken (JFC), nibble on our avocado and tofu salad, try our delicious mountain vegetable rice bowl, or order our tasty terryaki chicken dinner. Consuming raw or undercooked seafood may increase your risk of foodborne illness. Location: On the west end of Main Street Mall in Breckenridge, Colorado (311 S. Main Street) -- facing Skelly Pond and Peak 8.
for dinner, and see you tomorrow!